Every day, thousands of Madrileño students pass by a monumental arch called el Arco de la Victoria (or victory arch) as they make their way into the city's Complutense University. The vast structure is similar in appearance to the Arc de Triomphe in Paris, but unlike the French model this was not constructed to celebrate some famous victory in which Spain vanquished a foreign foe. The grandiose construction was built by General Franco to celebrate the defeat of the Second Republic by his nationalist troops in the civil war, which raged between 1936 and 1939. 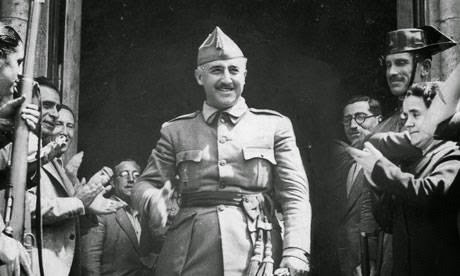 Franco's victory came after a conflict that left up to half a million of his fellow Spaniards dead, the country in ruins and presaged the outbreak of the second world war. Further into the university campus the same students pass by a much smaller memorial, so modest that many of them will not even be aware of its existence. A simple metal column, paid for by many individual private donations, bears an inscription dedicated to the thousands of volunteers of the International Brigades who went to fight in Spain. In November 1936 the university campus became a key theatre of the war. As Franco tried to take Madrid his troops were resisted there in some of the bloodiest fighting of the conflict: hundreds of international brigadiers died alongside locals defending the faculty buildings under the famous slogan which has became a rallying cry for anti-fascists ever since: "No Pasarán". It might be thought that at a time when there is a rise in xenophobia and racism across Europe this small memorial to those motivated by the fight against fascism in the 1930s would be coveted by the city. In fact, it seems that the rightwing Popular party (PP) that runs the city is not prepared even to tolerate its existence. Earlier this week the supreme court of Madrid upheld a complaint that the memorial did not have planning permission and the university authorities have now been given two months to remove it. In turn, the university authorities claim that they have applied for planning permission but the town hall has not acknowledged the application. The university also point out that other much larger memorials – such as that to the victims of the 2004 train bombings – were erected without the required permits. Explaining the past to shape the future is a basic tenet of any mature political process. Outside Spain, other European countries are increasingly able to face up to their own dark history. Visitors to cities such as Berlin, Nuremburg or Lyon, for example, will find world class museums that deal candidly with their role in the 20th century, and Liverpool's museum of slavery sheds light on a shameful episode for the British. Yet in Madrid there is not a single information point or visitor centre attempting to tell the history of the civil war. The PP administration is unable to deal with the diversity of claims on the past and so it prefers to try and lock down any discussion at all. Notwithstanding the scores of streets and squares in Madrid that still bear the names of members of the Franco regime, let alone monuments such as the Arco de la Victoria that celebrate the crushing of one half of the population, it now seems that political spite will do away with the only commemorative plaque to the International Brigades in the entire city. It is often said that history is written by the winners. But what is happening in Madrid is not just an asymmetrical exercise of historic memory. It is an intolerant, dangerous, dysfunctional way to treat the past and sits uneasily with the image Madrid likes to project as an open, diverse and transparent city of the future.